Time discounting is the phenomenon that a desired result in the future is perceived as less valuable than the same result now. Economic theories can take this psychological fact into account in several ways. In the economic literature the most widely used type of additive time discounting is exponential discounting. In exponential discounting, the fall of valuation depends by a constant factor on the length of the delay period. It is well known, however, that exponential time discounting often does not describe well how people actually behave. Most people are averse to short delays in gratification now, while their future selves may not mind a bit of extra waiting. This behaviour can be described well by non-exponential discounting functions such as hyperbolic discounting. In hyperbolic discounting, valuations fall rapidly for small delay periods, but the fall gets slower for longer delay periods. Hyperbolic discounting captures phenomena such as procrastination, addiction and in general inconsistency over time. This chapter investigates whether forms of non-exponential discounting, in particular close to the so called Quasi-Hyperbolic model, could also be characterized in terms of dynamically consistent choices when individuals discount the welfare of future selves as well as their payoffs. Dimitri, N, & van Eijck, D.J.N. (2011). 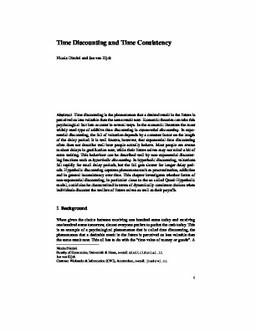 Time Discounting and Time Consistency. In Games, Actions and Social Software. Springer.